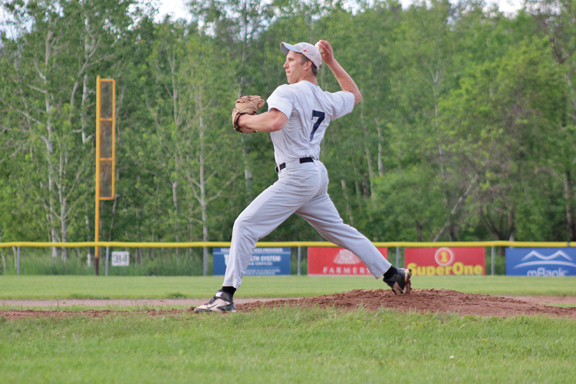 NEGAUNEE — Steve Daavettila kept the Negaunee Blasters’ offense at bay, only allowing one run through the first four innings for Coldwell Banker-Craig Heinonen in a Superiorland Baseball League game contested at Irontown Field in Negaunee on Monday night. Daavettila pitched five strong innings, allowing just three runs on five hits and recording two strikeouts and two walks in the 5-3 victory for Coldwell. The new adult baseball league, which includes five teams in Marquette County and one in Channing, was in its third week of holding weekly games on Monday nights. Jay Daavettila entered the game in relief for his brother, earning the save with four strikeouts and a walk without allowing a hit over the final two innings. Jay Daavettila earned high praise from his sibling. “He came in and he was throwing strikes and he struck a bunch of guy out,” Steve Daavettila said. The offensive party started in the second inning when Mark Daavettila hit a two-out double. Brian Pietila followed that up with a base hit and it was Craig Storm knocking home Daavettila with a single followed by a Paul Storm double to bring home Pietila to make it 2-0. The Blasters scored a run in the bottom of the second inning on a sacrifice fly from Eric Anderson. Much of the Blasters team is made up of players on the Negaunee High School team this spring. In the third, it was Mark Daavettila again getting the two-out rally started when he stroked another double and brought home Kirby Frantti and Steve Daavettila. Jay Daavettila added an RBI single in the fourth inning to built his team’s lead to 5-1. The Blasters had a surge in the fifth when Erik Voskuhl hit an RBI single to bring home Trevor Burke. The Blasters then had a player steal home to pull within two at 5-3. The Bankers weren’t going to allow their younger counterparts to come back all the way, though. In the sixth, Jay Daavettila fanned all three batters he faced, then in the seventh added one more strikeout to his total, which was the one that sealed the game for Coldwell. For Negaunee manager Brett Argall, this game was a chance for some guys to get playing time. The Blasters used three pitchers who combined for nine strikeouts and five walks. Mark Anderson started and had five of the strikeouts along with one walk. Batting leaders included Coldwell’s Mark Daavettila, who went 2 for 4 with two RBIs, and Paul Storm, who was 2 for 3 with an RBI, stolen base and walk. Voskuhl led the way for the Blasters, going 3 for 4 with an RBI and three stolen bases. Superiorland League games will be contested each Monday night through mid-August, except July 3, with games starting at 6:30 p.m. in Gwinn and Negaunee and 7 p.m. in Channing. Next week, just two fields will be in use as Congress Pizza faces 906 Sports Bar & Grill in Negaunee while Coldwell Banker-Craig Heinonen travels to Channing.